The Hindu has a special section on 125th anniversary of Indian math genius, Srinivasa Ramanujan. This excellent collection has articles on ancient numbers in India, overview of combiantorics in ancient and medieval India, Understanding Ancient Indian Mathematics, Ramanujan Timeline, etc. 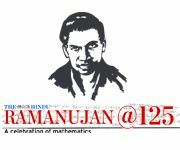 It is heartening to see that several events are being organized worldwide on Ramanujan’s 125th anniversary. I will try to follow and possibly link them here. please inform me about the activities . It was an wonderful experience to attend 26th.Ramanujan Mathematical Society Conf. -2011 at Allahabad University.Being engaged in industrial activities related to Mathematical design & Manufacturing of Vibration and Shock isolation Systems for power plant machineries to Aerospace applications we feel there is a grand correlation and blending with pure mathematics. Some of the published papers may be browsed through http://www.resistoflex.in. Interested to participate actively in National Mathematical Year 2012 and opt to deliver industry-academia oriented lectures in schools and colleges to inspire younger generation.